Matrix’ Air Spindle Refurbishment Center specialize in repair and service all types of PCB CNC high speed precision drilling, routing spindle, air bearings and ball-bearings. 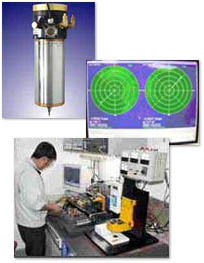 Air spindles received for repair are registered into the repair database. Spindle is disassembled into its major components with all critical features and tolerances inspected for damage and wear. An estimate amount for the cost of repair, including parts and services will be generated for customers approval prior to any work progress. All air spindle components are thoroughly cleaned and assembled. Any irregularity present on the spindle will be reworked to specification. New replacement parts are assembled as OEM original parts unless otherwise specified by the customer. Polar system representation of the balancing ISO grade G 0.1 is represented to the operator on two vectormeters as well as the exact digital indication. A well balanced shaft is the pre-requisite of a quality repair. All armature shafts are balanced to less than 0.0127 Gram/mm. After balancing and reassembly, both spindle and tool to static runout, dynamic runout vibration will be checked. Our aluminum ceramic porous vacuum chucks are ideal for extremely thin-walled work pieces, very soft materials (i.e. rubber, foils, metal bands etc.) or use in precision optical work. Ideally suited for extremely thin work pieces (<1mm finished Dim., depending on the material) and equally for foils down to less than 0.1mm thickness. 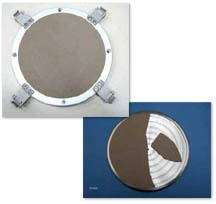 Due to the absence of grooves and holes work pieces are not easily deformed. Frequently use in precision machining in the optical industry and for measuring and checking in micrometer and nanometer range. Our aluminum ceramic porous chucks must be covered entirely or the largest possible extent. Covering unused areas with foil also improves the holding force.